Live Trend Trading Technique which Made Sweet 60 Point Trend Trading Fortune. Trend Trading Techniques are not unique these days. Everyone claims to be an expert in trend trading techniques. But the truth is, they are not. Options trading in India is a market filled with people who make a fortune just teaching how to trade in futures and options rather than really trading in the market. People hardly have their horses tied on their trend trading techniques. Trend trading is a unique strategy which makes us money though the market has the slightest chance of an up/down move! There is hardly any methods which make any better money than trend trading techniques does! My trend trading technique is backtested on Nifty Futures chart for 1.5 years, day in and day out! I trade with this unique technique with Nifty, Stock and Commodity futures in India and US. My Technique is completely based on nothing but Confirmation of trade in Technical Analysis. Own technique, I’ve devised and backtested and not a copy-paste strategy. Combines 6 statistics to make sure the trade is almost guaranteed. Have about 70 – 83% Win Rate in any kind of market condition! Works really well with Nifty Options Trading combined with Delta to find the target! This unique technique uses a very unique strategy which unlocks the market entry before much Upmove/Fall has already taken place. So what are you waiting for? Check out my Nifty Options Training for Intraday Profits. 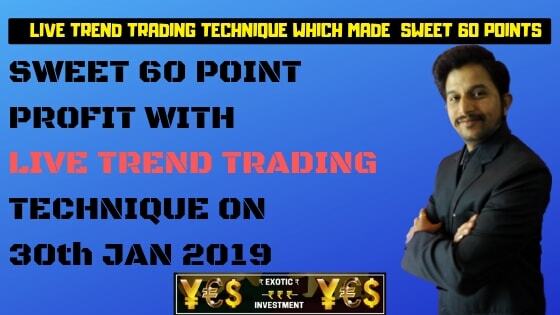 Take a good look about the Live Trend Trading Technique which I traded on 30th Jan 2019. Why should you care about this Trend Trading Technique? Most lucrative money minting strategy of all. Only depends on Live Technical Analysis for the full trade analysis. Completely dependant on my own backtested strategy. 100% Unique, if someone else teaches you, he is my previous student. Combine 6 trading indications to make it Iron Clad, Bullet Proof Guaranteed to make money! Make sure to share this post as this would help many traders with a Life Living Income! Sharing is Caring my Friend! Happy Trend Trading in Futures and Options in India. Happy Money Making!